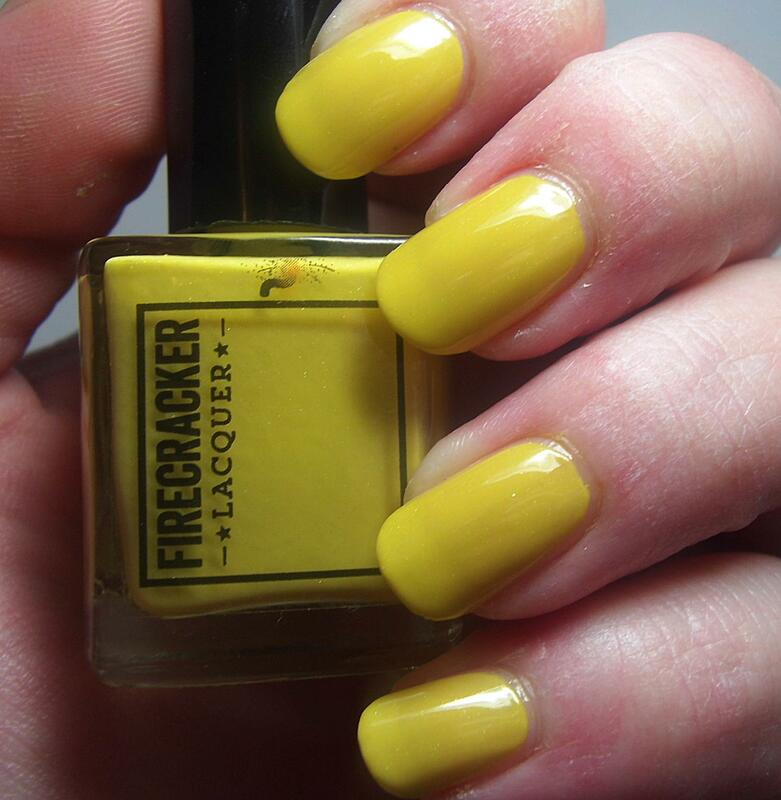 New to Me Brand – Firecracker Lacquer! 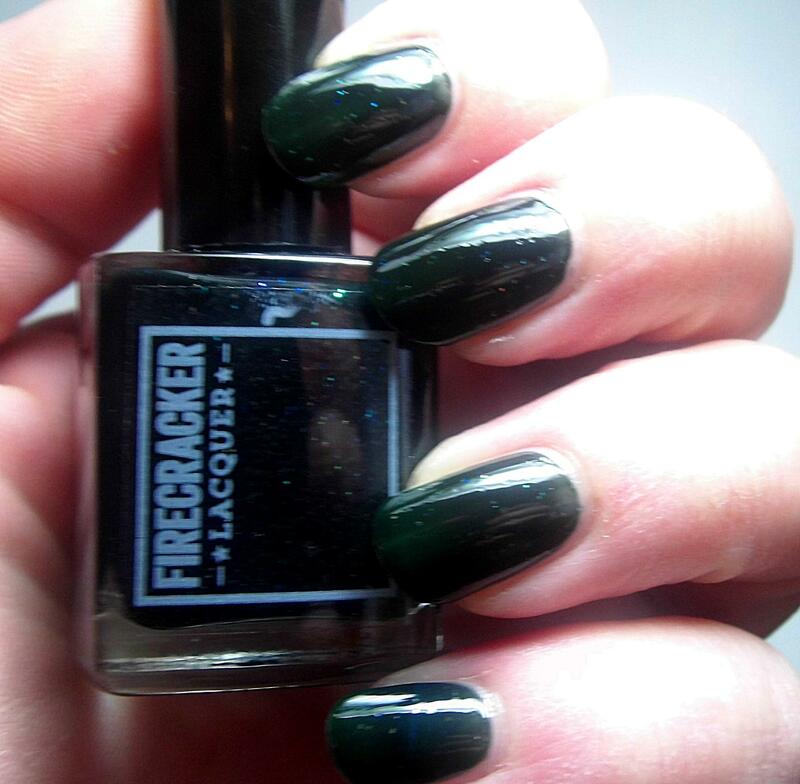 When the lovely Kendahl from Firecracker Lacquer reached out to see if I would be willing to review some of her existing line polishes I was flattered and said yes right away! I’ve noticed the brand but as you all know as much as we treat nail polish like pokemon (Gotta catch ’em all!) there are tons on the market and I hadn’t gotten that far yet. I was totally excited to try them out and I have four fabulous shades for you today! 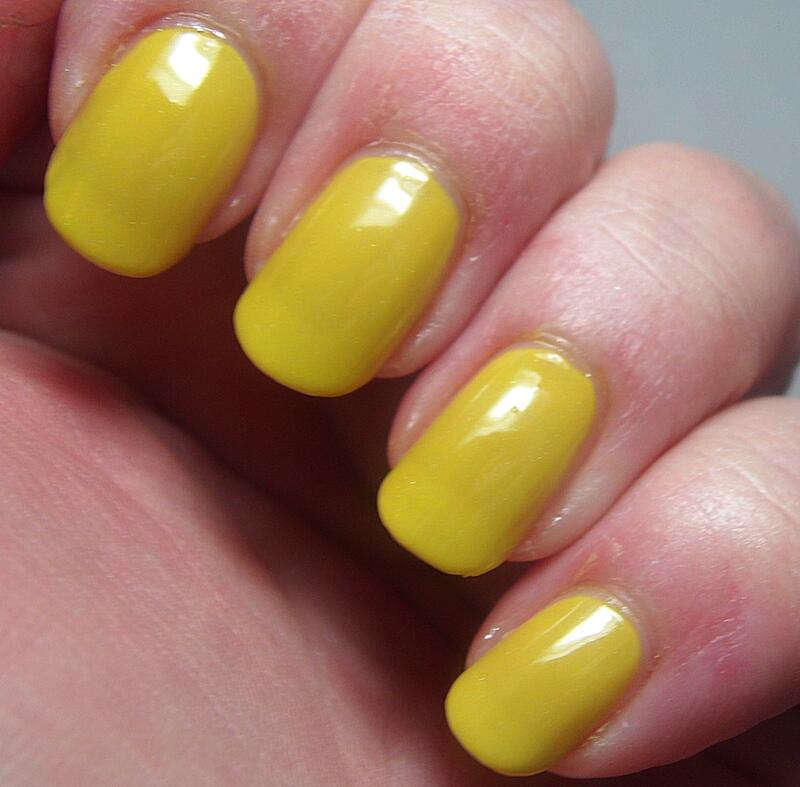 Canary Cavalcade is an bright canary yellow (how appropirate right?) creme filled with a golden microshimmer. It’s bright and sunshiny yellow and makes a great base under glitter toppers too! I’m sure I’ll use this a lot in nail art as I don’t usually have a lot of yellow in my collection! I didn’t have any application issues with this one. It was a tad streaky on the first coat but that resolved itself with subsequent coats and leveled out very nicely. I have very prominent nail lines so I did need three coats plus topcoat though I think that folks with shorter nails or less prominent nail lines will be perfectly fine with two. Polishes used: Glisten & Glow – Stuck on Blu; Firecracker Lacquer – Canary Cavalcade; Digital Nails – Ain’t Nobody Got Time for That Topcoat. Comin’ up now is Crawlin’ Queen! 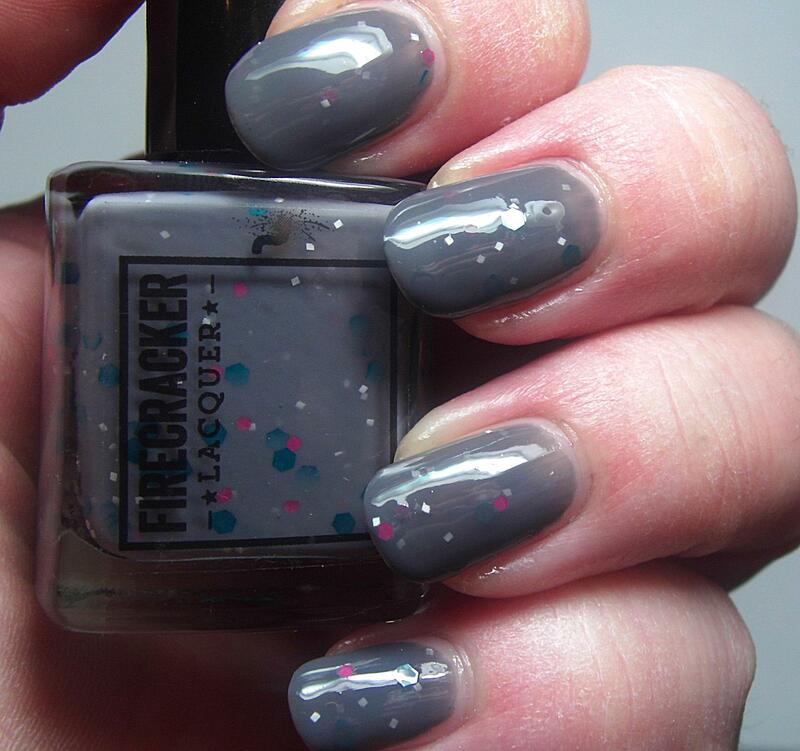 Crawlin’ Queen is a lovely medium gray crelly with hot pink, teal, and white matte and satin glitters. It’s squishy and I love the color combination. 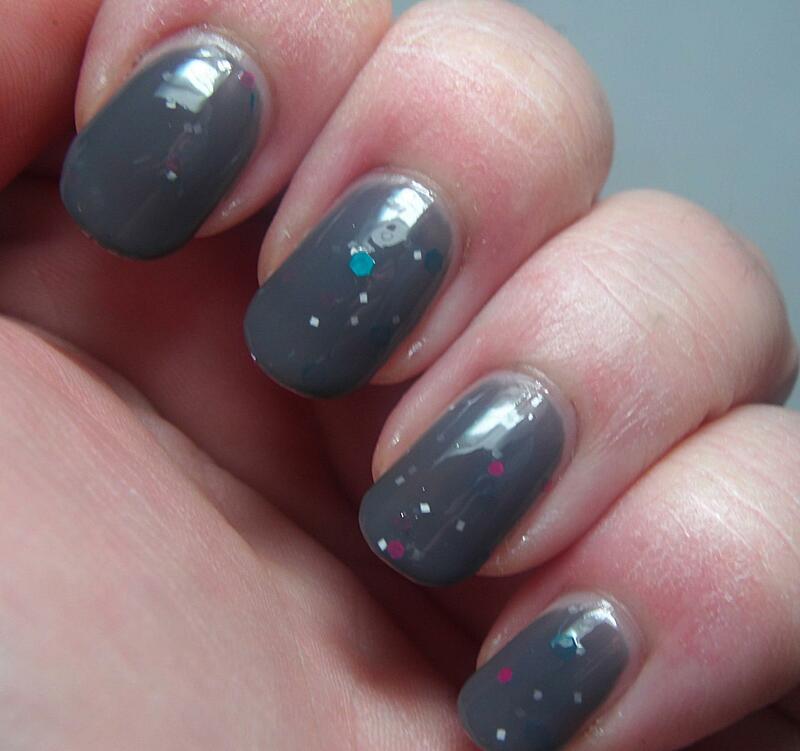 I admit it I’m always drawn to gray crelly glitter polishes. I also admit that right now I want ALL THE GRAY POLISH. It’s totally a thing with me right now! The crelly base on this one is perfect. Opaque in two coats but still squishy and gorgeous. The glitter spreads out nicely but is a bit on the sparse side but I think that this is by design and while I don’t find it off-putting I do admit that for my taste I sometimes prefer more glitter however, for those folks who aren’t as fond of a lot of glitter will love the ratio in this one. Application was totally awesome and picture shows two coats plus topcoat. Polishes used: Glisten & Glow – Stuck on Blu; Firecracker Lacquer – Crawlin’ Queen; Digital Nails – Ain’t Nobody Got Time for That Topcoat. 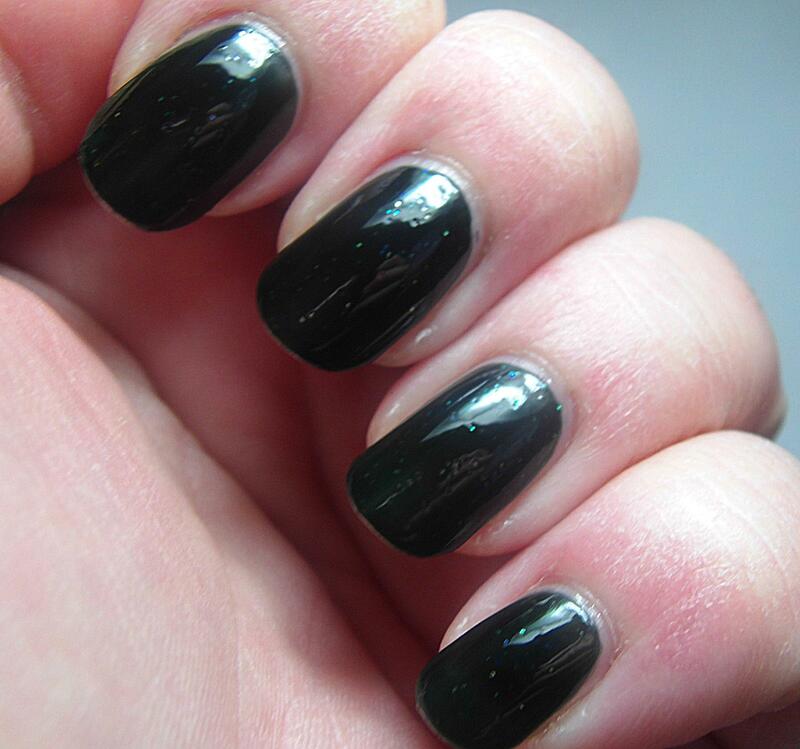 This is a deep dark blackened teal green (more on the green side than blue almost straight green) jelly polish with blue, copper, and green iridescent microglitter. This is one of my favorites of the group I got. When it comes to grays, greens, blues, teals I’m a total sucker. Plus I love jelly polishes. The jelly consistency means that the first coat goes on and doesn’t look like much but then additional coats and it just comes to squishy life. I love the shiny sparkly bits of glitter that float throughout. The glitter spreads out quite nicely and give a lovely subtle shimmer and shine. Polishes used: Glisten & Glow – Stuck on Blu; Firecracker Lacquer – Oceans Deep; Digital Nails – Ain’t Nobody Got Time for That Topcoat. 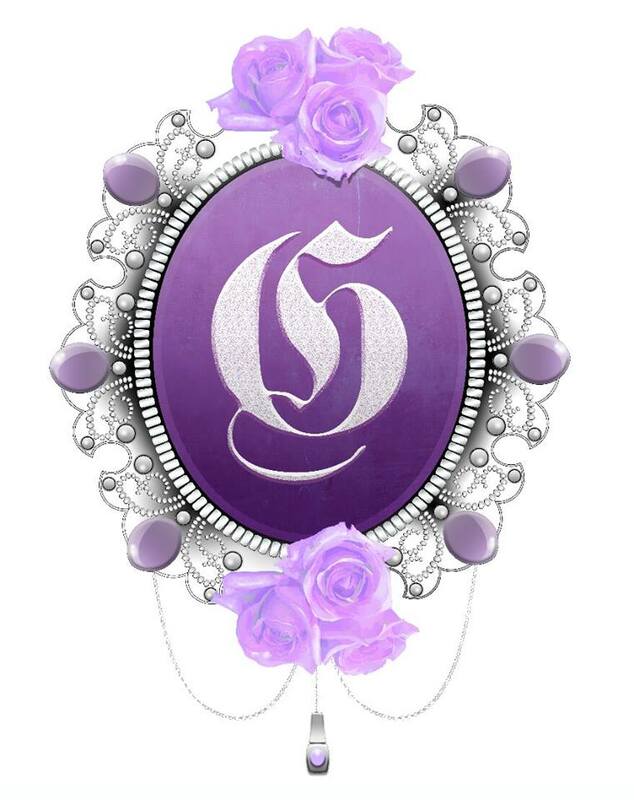 I freely admit this is my favorite of the group. 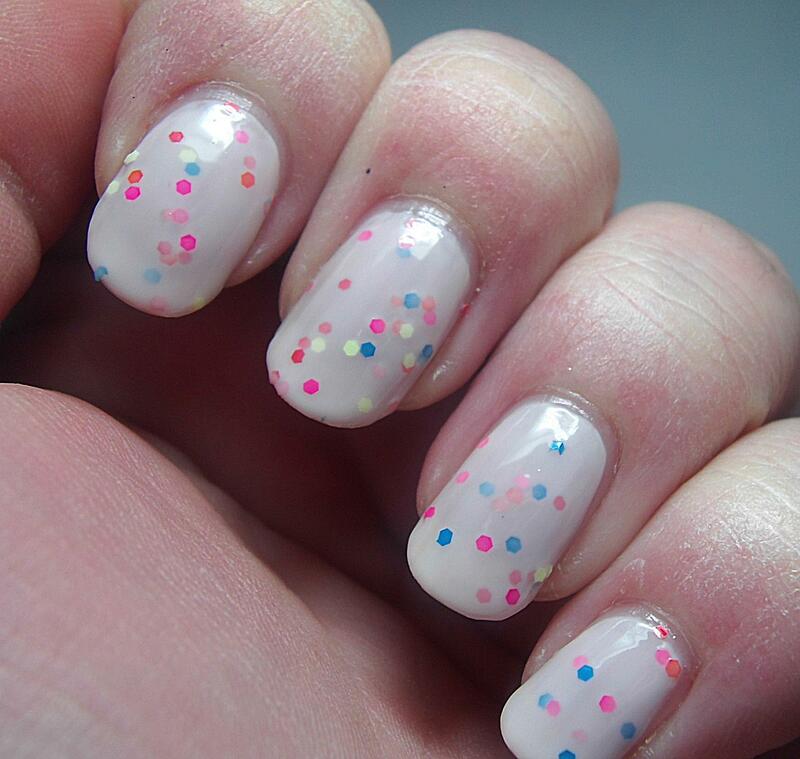 This is a soft pink crelly with hot pink, blue, red, pastel yellow, and orange satin glitters. It’s like clown make up in a bottle which I kind of think was the idea. It’s fun and while it was part of her Halloween Horror Movie Collection I still find it cheerful and delightful! Application was delightful on this one. The glitter spreads and disperses very nicely and the base starts out sheer but builds up very nicely. The leveling is great particularly for a crelly glitter polish which can be touchy at best. Pictures show two coats plus topcoat. Overall I’m very happy with these polishes and I can’t wait to see what else she has coming down the pipeline for the winter. 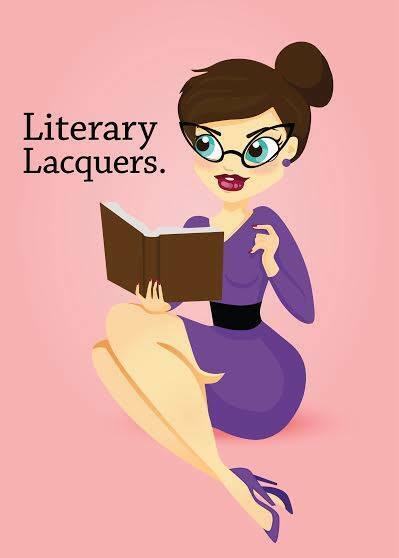 You can get Firecracker Lacquer in her Etsy shop and make sure that you check out her Facebook and Instagram so that you can keep up with all the new stuff she comes up with! 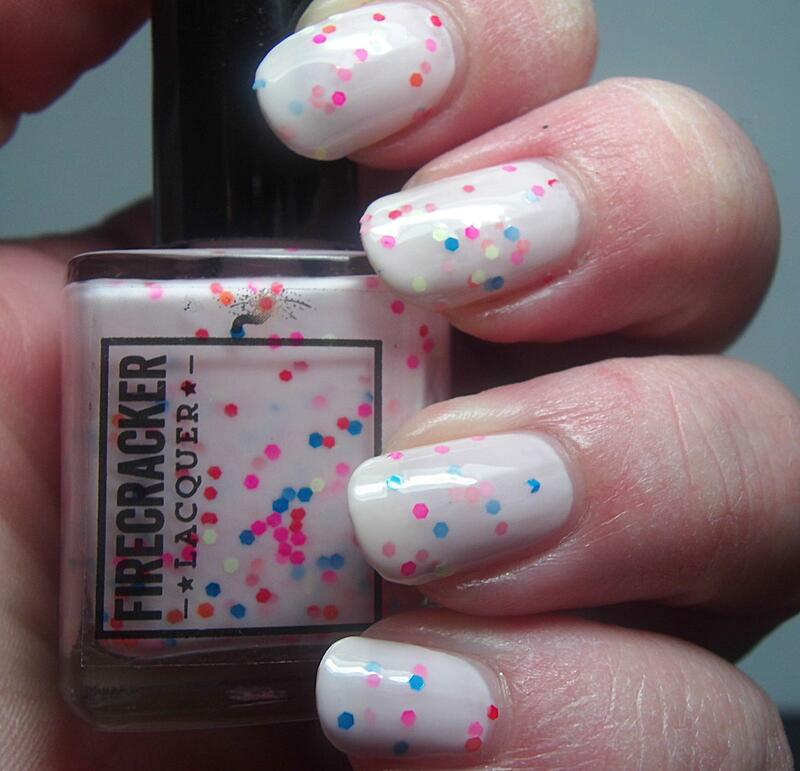 This entry was posted on December 11, 2014, in Firecracker Lacquer, Indie Polish.